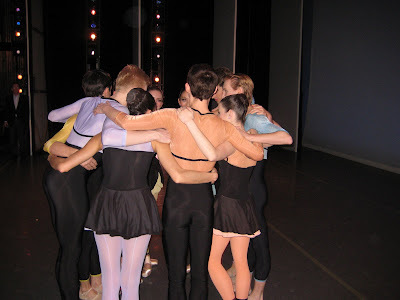 Since it is written in the playbill that Peter Martin’s Ash is my favorite ballet, I thought I should say a few words. Ever since we debuted Ash two years ago, I have been waiting eagerly for Christopher to bring it back into our repertoire. Ash is one of those ballets that charges up your spirit, while at the same time taking every ounce of energy out of your body. It requires a high level of physical endurance, which is why I had to start taking a spin class at the gym twice a week to prepare. From the moment the curtain rises, the incredible Michael Torke music propels the dancers back and forth across the stage, gaining momentum until the end, fifteen minutes later. Mia and I were talking about how this ballet feels like such a journey to get through. Even though the ballet is not very long, a lot of mental strength is required to make it to the end. Just convincing your muscles to keep going is more than half the battle. But, as a dancer, the satisfaction comes in being victorious in the end. I’m getting to perform Ash in every show, so not only is it keeping me in pretty good shape, but it gives me the opportunity to perform with different casts of dancers. At times, I begin to feel like the eye of the storm, and I gain an interesting perspective as I see the mood of a performance change with new dancers in the role. It’s been such a thrill getting to experience Ash again, and if you haven’t, you only have two more chances to do so. And if, when you see me on stage, I look like I’m having the time of my life, now you know why. OBT's cast of Ash from Sunday, February 22, 2009 pre-curtain. Dancers: Yuka Iino, Chauncey Parsons, Grace Shibley, Brian Simcoe, Martina Chavez, Adrian Fry, Olga Krochik, Matthew Pippin, Juila Rowe, and Christian Squires. We are fresh off our opening weekend of Lambarena, our winter rep program. I am thankful for a little R&R after an intense week. This is a very difficult rep for the dancers. All three have scores that are tricky to keep up with and each has it's own style of movement. The second half of our season is such a brilliant contrast to the beginning. From September through December we floated through endless scores of Tchaikovsky, stood in very neat lines and wore a few tutus. The second half of our season, this show in particular, involves grittier music and the entire company trading in their "swan-bonnets" for red leotards/shorts, and scooting across the floor in a bug-like fashion. It's an excellent contrast, and as Mia said, I think it's wonderful that this rep is showcasing our contemporary talents. The highlight of my weekend was definitely premiering Rite of Spring with my wonderful partner, Anne Mueller. Anne and I and the whole company have been working with Christopher for weeks and it all came to an amazing and inspiring fruition on Saturday night. It felt unbelievably electric. I gave Anne her merde-gift before the show, and in her note I wrote, "Now let's go cause a riot," referencing the riots that ensued at the ballets original premiere. I was overwhelmed by the enthusiastic response of the audience. At our opening-night-champagne-toast that night I talked with Kim Dawson (see OBT blog archives for June 2008: Kim stitched all of those beautiful Raymonda tutus back in June for our Russia Program) about the premiere. She was blown away and couldn't say enough about the piece. She said that it was such a relevant program for the current economic times that we're in. She was so inspired by the on-the-edge dancing, the pushing of the envelope and and the vulnerability that the cast represented vividly. And the beauty that can ensue when people take a risk and be vulnerable. I thought her words were very encouraging and inspiring to hear that the work that we've put so much into in the last few weeks is reading loud and clear. I can't wait to continue doing this work next weekend and hope that you can come see it a few times to enjoy the layers that this ballet has to offer. See you at the ballet. Please Vote for Niel DePonte on YouTube! OBT's Music Director and Conductor, Niel DePonte is a finalist in YouTube's Symphony Orchestra competition and he needs your vote! Niel is one of two remaining finalists in the marimba section - narrowed down from about 30 entrants. Winners will perform at New York City's Carnegie Hall in April! David Stabler of The Oregonian calls Niel's audition "great" and "more musical than the other contestant." To vote for Niel, click here. Press the vote button, type in "marimba," click on Niel's video and press the thumbs UP button! Please vote daily through February 22, 2009! This is becoming my Sunday night ritual. Next Sunday, look for a recap of the week's events, from tech rehearsals to dress rehearsals to opening night and the morning after. On Friday, the two pianists who will play Rite of Spring for our performances, Carol Rich and Susan Smith, came to the studio to rehearse with us. It was, as always, a wonderful treat to hear vibrant, alive music after working with cd. The electricity in the room and in the dancing (already at a high level to begin with) skyrocketed. They sound incredible. Anne's role is quite demanding, and this was her first experience running through the entire ballet. She's looking a little red in the face here. I don't think I'm giving away any major secrets or ruining any surprises by showing you the photo below. I'll just let you wonder. You'll have to come see the show to find out what it's all about. So, the next thing Christopher did to help clarify what he wanted was to have the dancers try the new choreography without music, only with his counting out loud. That's very helpful when dealing with unfamiliar or complicated music. After we've gotten a little more smooth with the movements and understand (at least in theory) the counts, it is easier to move correctly within the music. OBT principal dancer Anne Mueller has been chosen as one of six choreographers whose work will appear at Ballet Builders 2009! Congratulations Anne! Anne's piece, Heartaches and Hotcakes, was choreographed in the summer of 2008 for Bozeman, Montana's Sweet Pea Festival and is set to seven songs by Patsy Cline. It explores the tragic love and loss of classic country music with breezy, ironic wit. The work features Anne, Artur Sultanov, Daniela DeLoe and Candace Bouchard. You can see Anne, Artur, Danie and Candace perform the work on March 14th at 8:00pm and March 15th at 3:00pm in the Dicapo Opera Theatre. For those of you in the New York area or who may be interested in heading out that way, visit Ballet Builders for tickets and further information. Alison Roper in Anne Mueller's Heartaches and Hotcakes. One of our most loyal and passionate volunteers was featured in a photo and article on the front page of the How We Live section of today's Oregonian. George Dover has been a friendly face and encouraging presence around OBT for years, taking adult ballet classes with enthusiasm and energy, staffing the gift boutique in the theater lobby, appearing on stage with us in various productions (Nutcracker, Swan Lake, and more) and generally being a wonderful friend to the organization. His wide, sunny smile is always a welcome and energizing sight. The article in the paper today is about the supernumeraries in Portland Opera's upcoming production of Turn of the Screw, in which George will be appearing. I've noticed him in opera productions before (don't think you can't be picked out of a crowd, supers!) and immediately scanned the photo and article for a familiar face when I saw the headline this morning. And there he was. (I quite appreciated his comment in the article about the importance of moving in coordination with musical cues when appearing in ballet productions). Congratulations, George, and merde for the performance!